The Durability of our Classic Handmade bags has separated us from competitors for 20 years. Our Medium/Large Chalk Bags measure 7.5" tall, the perfect diameter for your fist. The perfect size for an ambitious day of climbing or your next bold adventure. Classic Handmade bag with Water-Resistant Rip-Stop, plated with a Unique Eco-Canvas Print, Reinforced with heavy nylon webbing. Polartek Fleece Lining with an adjustable Snag-Free Draw Cord, and 2" elastic grip to keep your chalk clean and where it needs to be. Zippered Pocket which fits the average-sized phone, so take a photo from the top or stash a snack. Adjustable Waist Band with a featured whistle buckle. Life-time Warranty. We love to see our bags used. Give us some love, We'll send it back. View More In Chalk Bags. 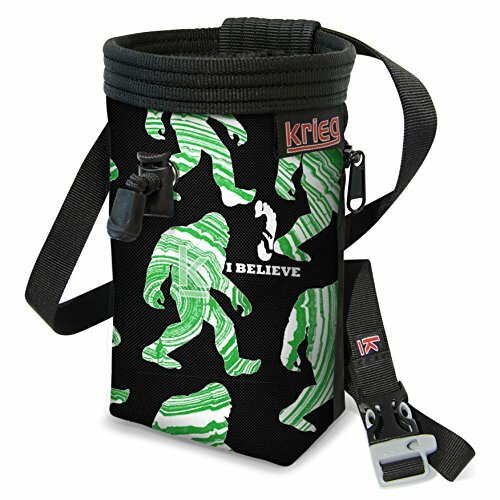 If you have any questions about this product by Krieg Climbing, contact us by completing and submitting the form below. If you are looking for a specif part number, please include it with your message.